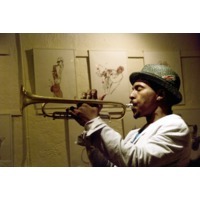 Roy Anthony Hargrove (born October 16, 1969) is an American jazz trumpeter. He won worldwide notice after winning two Grammy Awards for differing types of music, in 1997, and in 2002. Hargrove has played primarily with jazz musicians with stellar careers, from Wynton Marsalis to Herbie Hancock. Hargrove is the bandleader of the progressive group the RH Factor, which combines elements of jazz, funk, hip-hop, soul, and gospel music. Its members include Chalmers "Spanky" Alford, Pino Palladino, James Poyser, Jonathan Batiste and Bernard Wright.